There is a new book out called "Jewelry Savvy". The authors are Caroline Stanley and Cynthia Sliwa. There are tons of topics of interest in this book but the one that I’d like to share with you is about selecting earrings. There is a fascinating theory on the proper shape, size, and styles of earrings that are the most flattering to each face shape. The book is complete with illustrations of face shapes and the corresponding suggestions for the most complimentary jewelry for each shape. Understanding how earrings work with the shape of your face is key. Basically, earrings that repeat the overall shape of your face bring emphasis to its shape. If your face is not oval in shape, you are advised to camouflage elements of your face that deviate from the oval shape. An example would be that button earrings emphasize a round face. A drop earring that contains curvy lines introduces elongating vertical lines that can actually distract from and downplay that roundness. Square earrings are not the best choice for a square face. An oval earring tends to have the effect of softening angular lines of a square jaw line. The good news is that stud earrings are attractive on just about everyone because they do not detract from the natural shape of the ear. Neither do they detract from the shape of the face. As a general rule of thumb, the size of the earlobe should dictate the appropriate size of the stud earring. So, if you are having trouble choosing earrings or are choosing earrings as a gift, remember that stud earrings work for most ears and personality types. Popular studs include pearl, diamond, gemstone or metal. Studs are a foolproof look. Remember - the eye is drawn to the point at which the earring ends especially if the earrings are sparkling or shiny and have movement. Another style of earrings that has almost universal attractiveness and appeal is a 3/4" to 1" diameter shell shaped earring. The third category in the foolproof look group is hoops with the most flattering size being 3/4" to 1" in diameter - oval or round in shape and just metal or with diamonds or gemstones. Most women wear hoops that are too large to flatter their face. To focus maximum attention on your face, wear earrings no longer than your jaw line. With a square or triangular face shape, the earring should be preferably shorter and visually stop above the jaw line and deflect emphasis at the lowest point of the face. You might want to remember that your jewelry wardrobe is a reflection of your personal style. These three categories encompass hundreds and hundreds of styles of earrings. Another fact - you do not have to have just one of anything. (This includes your wedding band.) 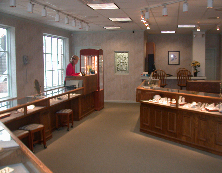 Come see us and we’ll help you pick jewelry that is perfect for you!